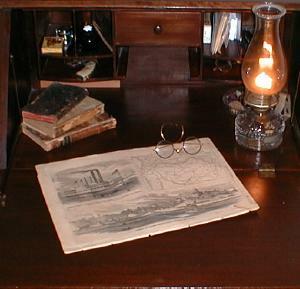 You are viewing an original 1861 Civil War illustration of Jefferson City, Missouri. It is from an 1861 edition of Harper's Weekly, the most popular illustrated newspaper of the day. Note that this is not a reprint, and I absolutely guarantee its authenticity. This leaf is over 140 years old, and the date is clearly marked on the front of print. On the day this leaf was printed, Abraham Lincoln was president of the United States, and the Civil War was in its opening chapter! This is a rare and highly collectible print. It is rich with important historical content. 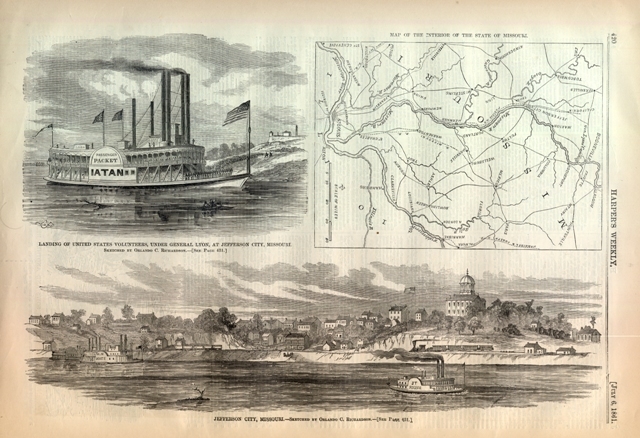 The image in the upper left corner shows a Mississippi Riverboat docking at Jefferson City. The image is captioned, "Landing of United States Volunteers Under General Lyon, at Jefferson City, Missouri". This is a great view of the riverboat, and the riverbank of the city. Smoke is shown pouring out of the stacks, and the US troops can be seen marching off the boat. A number of soldiers are pictured on the deck of the boat. The US Flag is shown flying proudly over the Riverboat. The Upper Right image is a fascinating period map of Missouri and part of Illinois. The map includes Jefferson City, St. Louis, Kinderhook, Booneville and other cities in the area. The Course of the Mississippi and Missouri Rivers is pictured on the map. The lower image is captioned, "Jefferson City, Missouri". It is a view of the city from the Missouri River, as it looked during the Civil War. It is a great view of the city. Riverboats are pictured steaming up the river, and a Railroad train is shown on the shore. There is a hill pictured with what looks like a courthouse on it. I wonder if this distinctive building is still standing. This is a fabulous leaf, and one that you will not want to miss. It will make a stunning display when framed and placed in your office or study. It is unusual to find this much interesting content in one leaf, and the map really makes it extra special. You will be able to spend hours studying all the interesting details. The leaf would make an excellent addition to your collection, of a wonderful gift for anyone interested in the Civil War. The reverse of the print contains interesting news of the day. You will not want to miss this one! Unlike newsprint of this century, these older, original pages do not yellow and fall apart. The reason is that modern newspapers use an acid based process. Remnant acid in the paper causes the paper to quickly yellow and deteriorate. A different process was used in the mid-1800's which yielded an exceptional quality paper that will last for centuries. Special acid free mats should be used when you frame this piece to ensure that it will last another 150 years. Acid free mats are available at most better frame shops. If you have any questions related to handling or framing this piece feel free to email me. The print is approximately 11x16 inches. I have been collecting Civil War Newspapers for over 10 years. It is a fascinating hobby, and I find that these pieces really get noticed when framed and displayed. The leaf is in good condition. It has the rich sepia toning that you expect in original material from this period. There are some spots of foxing, which can be seen in the picture above. There are finger smudges in the margins from folks handling the leaf over the last 130 years. There is a crease in the upper left margin, visible in the image above. Several very small margin tears have been professionally mended from the back side. The print will display very nicely. Copyright © 2003-2018 Son of the South. Are you Scared and Confused? Click Here to read My Snake Story, a story of hope and encouragement, to help you face your fears.